Be the first to share your favorite memory, photo or story of Efton. This memorial page is dedicated for family, friends and future generations to celebrate the life of their loved one. 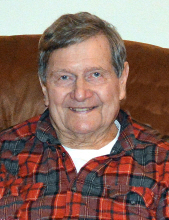 Roy Efton Wayman, 83-year-old longtime Vinita resident, went to be with his Lord on Thursday, April 4, 2019. He was born on October 7, 1935 in the Estella area of Craig County, to Juanita Fern (Lay) and Melvin Henry Wayman. Efton grew up in Jet, Oklahoma. After graduating high school, Efton attended college at Northwestern in Alva. Efton and Rosetta Marie Parsons were married on February 2, 1957 at Bunker Hill church west of Vinita. He worked for Northeast Rural Electric Cooperative for 38 years retiring in 1995. Efton worked in many capacities for the Co-op including, billing clerk, dispatch and head cashier. He was an avid quail and pheasant hunter, fisherman, spending a lot of good times on REC’s dock, fishing on Grand Lake. Efton also was a little league coach for many years in the Vinita Little League. He was a member of the New Life Church of Vinita, in his earlier years Efton had served as a Sunday School Teacher for the 3rd,4th, and 5th grades at Trinity Baptist Church in Vinita. After his retirement Efton enjoyed, working with his tractor, helping neighbors and friends when he could. Most of all he loved spending time with his kids, grandkids, great-grandkids and great-great-grandkids. He was preceded in death by his parents, a brother Kenneth Wayman and a sister Melva Babcock. The family includes; his wife, Rosetta Marie of the home; children, Monica Waymire and husband Mike of Vinita, Randy Wayman and wife Cindy of Vinita, Doug Wayman and wife Debbie of Broken Arrow; eleven grandchildren, twenty-two great-grandchildren and four great-great-grandchildren. The family will receive friends from 6-8 PM on Sunday, April 7, 2019 at the Burckhalter-Highsmith Funeral Home. Friends may give to the Vinita Backpack Program in Efton's Memory. The celebration of life will be held Monday, April 8, 2019 at 10:00 AM at the New Life Church south of Vinita, Pastor Kevin Baker will officiate. Interment will follow at the Fairview Cemetery in Vinita. Online condolences may be made at www.highsmithfh.com or on our Facebook page. Arrangements are by the Burckhalter-Highsmith Funeral and Cremation Service of Vinita. To send flowers or a remembrance gift to the family of Efton Wayman, please visit our Tribute Store. "Email Address" would like to share the life celebration of Efton Wayman. Click on the "link" to go to share a favorite memory or leave a condolence message for the family.